Our in-depth knowledge and industrial expertise enable us to offer a distinguished range ofSurgical Scrub Sink. Our professionals manufacture theseSurgical Scrub Sink, Stainless Steel Scrub Sink, Operation Theater Single Scrub Sink, Double Surgical Scrub Sink, Baby Wash Scrub Sink,Single Surgical Scrub Sink & OT Surgical Scrub Sinketc. by making use of high-grade raw-material and high-end technology so as to maintain the set industry standards to make a flawless dispatch from our end. OurHospital Scrub Sinkare broadly acknowledged by our clients for their compact size, smooth finish, corrosion-resistance and sturdiness. 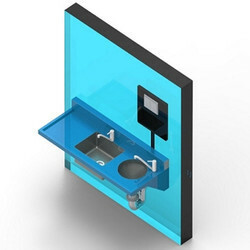 These sinks are rigorously inspected by our quality experts against various parameters. This unit comprises of a flushing conical sluice bowl, a regular sink bowl and a drain board measuring 1600 x 600mmx850 sink overall. The drain board can be situated to the left or to the right of the sluice bowl. Providing And fixing hospital stainless steel sluice sinkwith sloppy Hooper and p trap. This unit comprises of a flushing conical sluice bowl, a regular sink bowl and a drain board measuring 1600 mm x 600mm x 850 mm sink overall. The drain board can be situated to the left or to the right of the sluice bowl. Providing And fixing hospital stainless steel sluice sink with sloppy Hooper and p trap. 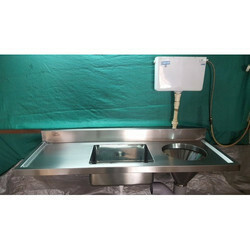 Stainless Steel Sluice Sink with Sloppy Hopper is designed for drying specimen bottles and bed pans rack. Manufactured from 1.6mm commercial grade 304 stainless steel sheets and. Ideally suited to aged care facilities and health projects - often in conjunction with the CMP METAL Dirty Utility Sink and Hot water-cool water Dirty Utility (sluice) in hospital dirty area. We are the leading manufacturer of Sluice Sink.